Just after one day after finish of world cup circuit for this year, I had another competition. 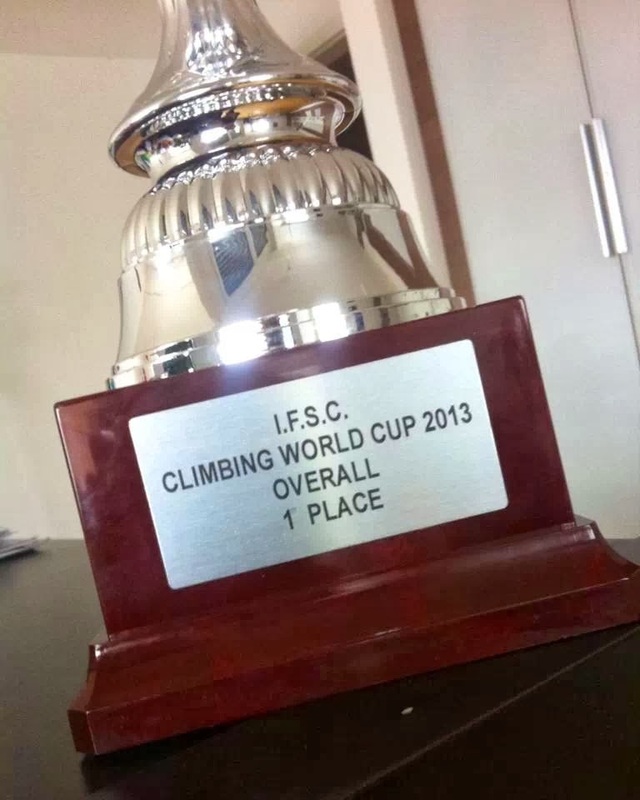 It was military climbing competition, on which also some international teams were invited. About the climbing, I have just enjoyed it really much! First day we had qualifications (they were made in kind of 'open' format with 5 routes, 16 boulders and plenty of time to try and do it). Routes were not really big challenge for me at the moment, but with some boulders I had some more fun. But, together with Klemen Bečan (personal 'hold brusher' and 'beta-giver' at that time: ) ) I managed to do also some harder pieces. 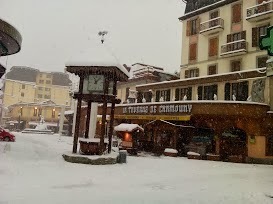 Some more walk around snowy Chamonix, little bit of shopping at local stores, coffee/tea in the down town and perfect climbing adventure day was over. Next day it was time for finals. It was really interesting to climb same route together with men. Me, Maja Vidmar and 3 guys managed to finish final route and climbed also in superfinal, what was super cool step of an event. (and I also managed to come to the highest point of all :P ). 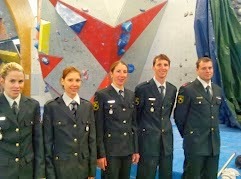 It was also really successful event for Slovenia armed forces team, with 8 medals and 1st place altogether between teams (1st , 2nd and 3rd places for me, Maja Vidmar and Martina Čufar in lead and boulder and 2nd place for Klemen in lead and boulder). Just to add, I think this trip will stay in my memory for long time. It was well deserved award for all year's training, competing and travelling around. Well, penultimate lead WC stage is behind us and I have took 2nd place. Still, we have to be unique, every podium and medal is really nice result! But, I admit that I am maybe not most brilliant satisfied with it. I have started competition well, maybe little bit stressed, but there was already totally different situation next day. In semifinals I have focused on route, climb fluid and precise from start to top and clip the last quickdraw easily. As I was the only one to do the top, I went into the finals with good attitude and confidence. Won went to JaIn Kim and 3rd place to Momoka Oda. It was also very nice to see Adam Ondra back to comps (he took a gold) and Maja Vidmar after injuries(s) back in finals again! Congratulations to all! After come back from China I have spent some really nice and precious time at home. I took some time for rest, training, meet friends and just enjoy really nice autumn in Slovenia. It was also time for national competition in Tržič. It was nice to compete on local level after a while, meet and spent some time with local climbers. We had, sure, also very nice routes and after 2 tops, I took a gold, 2nd place went to Maja Vidmar and 3rd to Tina Susteršič. By boys, Urban Primožič won infront of Domen Škofic and Sergej Epih. Next day, I have used rest day a bit different as usually, take a short trip and went to visit my parents in my home town. It does not happen often, so I do not need to say, it was really enjoyable, warm and relaxed day at home. Short stop, but just something, what I needed at the moment. But, because there is not time for rest now, next day with Slovenija climbing team we visited really good climbing gym in Austria's Mitterndorf and did an perfect training (I am quite sure, I have mentioned it already for few times before, but for all who maybe missed it, you can check out more on here. 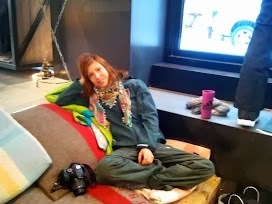 And sure, I recomend you to visit and enjoy even the hardest indoor route climbing there!:). In few days there will be time for 2nd latest stage of lead WC this year in Valence (France). Cross fingers and enjoy competition on 1st and 2nd of November (here). Competition went well and nice. First day I have topped out qualification routes and next days also clipped top of semifinal route. In finals I have climbed quite far, but fall few moves before the­ top. At the end I (and also JaIn) probbably took the wrong combination of hold/move sequence and tried to do the move, but it just does not work. So, despite of better performance and result in semifinals, I have took the gold. Happy for perfect end of long, successful and overall very fun week!